Head O' Bay is the perfect Caribbean vacation destination for families or couples who want a relaxing and fun-filled island adventure. Located on private property, you are free to relax on the deck or in one of the hammocks and enjoy the breathtaking view of the beautiful, crystal clear Caribbean sea. Owen Island, otherwise known as "The Key", is just a short swim or kayak ride across the bay--it also makes for a great chance to snorkel and see a variety of tropical fish. Tourists from all of the world come to Little Cayman to scuba dive and experience the breathtaking view of The Wall on the north side of the island. 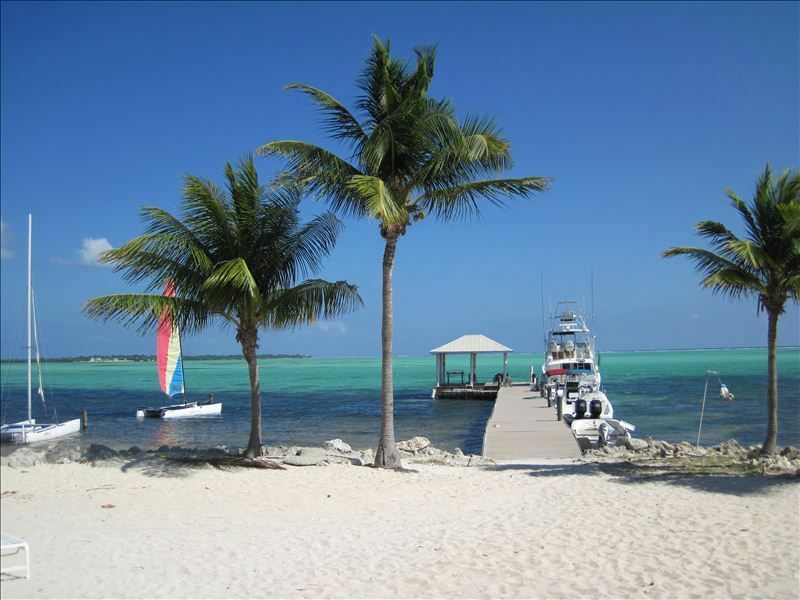 Sea turtles, Grouper, and Angelfish are just a few of the tropical life you will see here at Little Cayman. Let us know if you are interested in scuba diving and we will be glad to help you get set up for a diving trip with one of the resorts on the island. Bird-watching is also a favorite pastime of visitors who visit Little Cayman. The villa is equipped with a full kitchen, washer and dryer, and 2 bedrooms and 3 full baths (2 upstairs and 1 downstairs.) Extra sleeping on the fold out couch is available as well. With a grocery store on Little Cayman meals are easy to prepare. Come visit our piece of paradise and experience one of the most beautiful places in the world. Our family has enjoyed vacationing to this spectacular property since 1962, and we're happy to share our little piece of paradise with anyone who wishes to visit. We built our vacation villa to share the Little Cayman experience with others. Head O' Bay is right on the beach in the middle of the bay! Right in front of our dock is a tiny island called Owen's Island and is the most beautiful place to swim, relax, and watch the sunset. there's an assortment of books from previous guests, you never know what you'll find! The balcony is a perfect place to relax while taking in the magnificent views! There are two glass-bottom kayaks and 2 paddle boards available for guests. There is a small private pool on the property that guests are welcome to use. Every single part of it....sheer heaven. We are so happy y'all enjoyed our slice of paradise! Looking forward to having y'all come back. Why did I come home. Please take me back to Head O Bay absolutely love it there! We had a lovely time at this well appointed property right on the beach on this small, very quiet island. The property caretaker was very helpful and accommodating and we cannot say enough about how much we enjoyed our stay. Great comfortable place to stay. thank you so much for the good review, we are so happy y'all had a great stay! please let us know whenever y'all are ready to come back. Right on the water - wake up to THAT view - amazing. Included bikes, catamaran, paddle boards, kayak, outdoor shower. Trevor picked us up at airport; nice. Walked to town. Walked to Hungry Iguana restaurant and Little Cayman Beach Resort bar/grill. Road our bicycles to Pirates Point; but they picked us up everyday for scuba and brought us back. So easy. I am so glad y'all had a good time! I hope y'all will be coming back to stay at Head O' Bay again. The location on the beach is wonderful, the beds are great, the furniture is comfortable inside and on the porch, and the snorkeling on the island is superb. To offer constructive criticism, the electronics are lacking(no TV the entire stay and the WiFi which is transmitted from another building, requires you to go on the porch to get reliable access and moderate speed). The hot water heater is wired inadequately, requiring resetting the Breaker downstairs often. Trevor responded promptly however the technical nature of the issues were above his capability. He met us at the airport, and was always welcoming. If staying less than one week, add $150.00 cleaning fee.